Today’s Bible readings are from Exodus 37, John 16, Proverbs 13 and Ephesians 6. Exodus 37 speaks of the fabrication of the ark with its mercy seat (37:1-9), the table and its utensils (37:10-16), the lampstand and its utensils (37:17-24) and the altar of incense, anointing oil and the incense (37:25-29). The bronze altar was the place of sacrifice. Bronze speaks of sin and the perpetual fire (Lev. 1:5-7) on the altar symbolizes God’s judgment against sin. Jesus died on an altar; it was called the cross. He died for our sins on that cross. He suffered pain for our sins. The laver symbolizes our cleansing from sin – our holiness. Once we are forgiven of our sins, God starts changing us to make us truly holy as He is holy (Phil. 2:12-13; 1 Pet. 1:16). Water is symbolic of two concepts in scripture: 1) the Holy Spirit Who comes into our life, convicts us of sin (John 16:8) and starts living in us to change us (John 7:37-39); and 2) the Word of God which reveals to us our sin (John 15:3) and is useful for reproof, conviction, and instruction in righteousness (2 Tim. 3:16-17). While the mirror at the bottom reminds us that we will still see our true sinful self (Rom. 7:24), it is also comforting because the symbolism reminds us that God knows we are not yet perfect in this life. We have not lost our salvation; we are just not yet free from sin in this life. The gold lampstand speaks of the One who revealed the Father to us – Jesus the light giver (Matt. 11:27). He is the light of men. The light was to burn perpetually. Today, Jesus is not here in body but His Word is. By reading and studying it we receive spiritual light. The bread that was placed on the table represents God’s presence in our lives. In John 16 Jesus is preparing His disciples for when He will no longer be with them. It will be a time of persecution (16:1-4), but the Holy Spirit would be with them (16:5-15). The guiding work of the Holy Spirit (John 16:12-13). This primarily has to do with the Spirit’s work in the inspiration of NT Scriptures. The primary work of the Holy Spirit is to glorify Jesus Christ (John 16:14). The Holy Spirit doesn’t magnify Himself, but Jesus. Jesus also tells His disciples that they would see Him again, that He would “come back” from death (16:16-24). Then, their joy would be full. Finally, Jesus speaks of His ascension and return to the Father (16:25-33), again telling them that they would be facing persecution, but with the promise that Jesus has already won the victory (v. 33). 1 A wise son hears his father’s instruction, but a scoffer does not listen to rebuke. 18 Poverty and disgrace come to him who ignores instruction, but whoever heeds reproof is honored. Things are not always as they seem. One may make themselves rich, or one may have money but live in fear because of the threats one faces (v. 8). Transient treasures, what are they worth? I, who am deathless, I, who wear wings. Quicken my vision, open my eyes! Boundless as time is, endless as space. Lord, Thou hast given me all that is Thine! Remember that Jesus chose to become poor to enrich us spiritually (2 Cor. 8:9). Ephesians 6 continues Paul’s teaching on Spirit-filled relationships, addressing the parent-child relationship (6:1-4) and the master-slave relationship (6:6-9). The last section of Ephesians is the “stand” section on spiritual warfare. Paul tells us that our battle is “not against flesh and blood” but spiritual forces (v. 12). 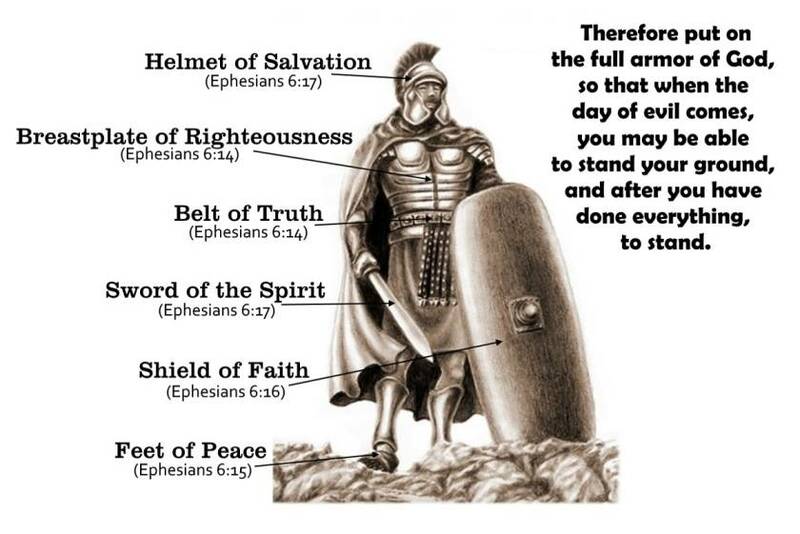 We are not equipped for this battle in our own strength or wit, so we must put on God’s armor (most of these items were worn by the warrior God in the Old Testament Scriptures). The problem with most Christians is that we live like we are on a playground when in fact we are engaged on a battlefield. David Jeremiah’s book Overcomer is a good explanation of what the pieces of spiritual armor are and how to use them.